Henry Green was murdered by police in his own neighborhood on June 6. He was shot without warning by plainclothes police who were there as part of a summer program that is alternately called a “Community” policing program or a “Summer Safety” program. Only the Columbus Police Department is investigating his murder. As his family, along with community organizers from his neighborhood press the city leaders for some real initiative towards justice those leaders have further entrenched themselves and their programs. This Columbus Dispatch, in it's coverage of the ongoing story, has been so biased that their editorial board may find itself in a box on the Police Department's organizational chart. Let's disassemble how and where this all happened. There are no questions here. There is no question about how undercover officers are engaging residents. They are engaging them with lethal force. So the question must be is Henry Green's murder a tragedy? That question has been answered by his family. This reporter has seen his mother's grief firsthand. Her grief is tragic. So maybe the question is did the police tactics “beget” this tragedy? Nothing else begot it. Henry Green was not struck by lightening. Had the officer's guns stayed in their holsters, there would have been no tragedy to beget. Henry Green was walking with a friend around 6:30. Henry Green was in his own neighborhood and legally armed. Henry Green's weapon was registered and he had a permit to carry concealed. A white SUV containing two plainclothes police pulls up, they jump out, scream “Stop! Stop! Stop!” and shot him dead. Neither had a badge displayed. They did not identify themselves as police. Every witness to the event who has publicly come forward has said the same thing. From a perspective of pure facts, nothing is in dispute except by the two men who pulled the trigger. How the Dispatch attacked the facts. In every story and editorial, the Dispatch has reported police claims as facts and witness statements as claims. Let's take a look into the editorial meat grinder that is establishment journalism starting with an unsigned editorial explicitly backed by the owner, publisher, and entire Editorial Board from June 19. Starting with “accounts differ” is designed to create doubt about facts before facts are even announced. The police side is now stated in short sentences in order to present the story told by police officers Jason Bare and Zachary Rosena as facts. No other witness heard the words “police” or “drop the gun.” The police have not produced a shelf-casing proving that Green discharged his weapon. The police are disputing the facts, and certainly could have produced hard evidence to do so, yet they have not. The very next words present what every other witness and person involved say as a claim rather than a fact. Did Green have a license or not? The Dispatch can find out. A concealed handgun license is a public record. The Dispatch knows how to get public records. Does the Dispatch know about this specific fact? Green obviously did have a license or the police would be trumpeting the fact that his weapon was illegal. The Dispatch's entire editorial board choose to call his family liars and him a criminal without a shred of fact or a minute of research. The Dispatch again turns Green's lack of criminal activity into a claim rather than an absolute fact, thus casting him as a criminal that may or may not have deserved to be shot dead in his own neighborhood. Yes. Ohio is an open carry state. The police murder of John Crawford for holding a pellett gun he was about to buy in a Walmart and the subsequent lack of prosecution belie the fact that open carry is for Whites Only. The previous link contains pictures of a crowd of white people with AR-15s in a rest stop in Ohio. They do not live in or near that rest stop. It is not their neighborhood. Nobody shot them with anything other than a camera. They are not the only ones who said that. The Dispatch itself has named witnesses that are not Green's family and not his friend. Green was murdered on a residential street. People saw and heard it. It was 6:30 in the evening. Many people were home and awake. The Dispatch editorial board chose to ignore their existance for the sake of presenting the police “side” of this story. That is eight factual distortions and uses of de-legitmating language in a single paragraph or one instance of distortion or delegitimization for every 12 words. I have friends and co-workers living in Linden and raising families there. They own homes. They have pets. They have gardens. They don't have barbed wire. I've been there at all hours of the day and night, on business and at bonfires. I've never heard gunshots. I've never been targeted for crime walking down the street. I've never seen an open air drug deal there. Linden is not the wild west and it is not a war-zone. Linden is a majority black working class neighborhood. The Linden-as-Fallujah narrative justifies the “Summer Safety Program” which is the Columbus version of an Iraq war troop surge. This summer safety program is also called a Community Safety Initative which is one re-branding from a counter-insurgency surge. The Dispatch has done more to help the mayor, police and prosecutor's office than a single editorial. Based on the timing of stories in this case and the information release in each, it is clear that the City Columbus and County Prosecutor Ron O'Brien have zero intention of bringing justice in this case or of preventing similar cases from happening in the future. A protest was held at the courthouse on June 15. The family and community organizers attempt to meet with prosecutor Ron O'Brien about the case. He was very deliberately not available. He was supposed to give a response to organizers within 24 hours. He responded to the Dispatch within 2 hours in time for them to go to press. He did not respond directly to the family. The Dispatch generously quoted him. He gave his answer not too the family but to the paper, and it was obviously a predetermined answer in the negative. 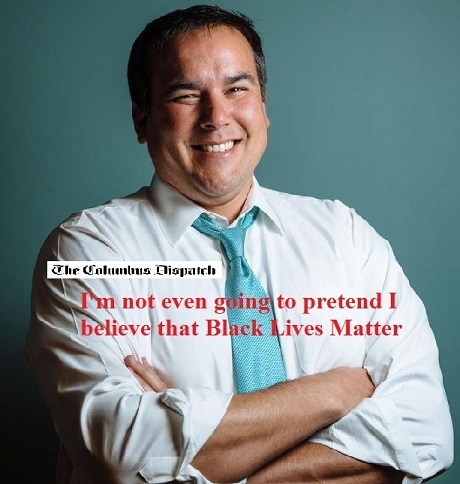 While Ron O'Brien was out to lunch, Mayor Andy Ginther was busy attempting to preempt the spread of protests. He met with police and black community leaders on Monday June 14. Those unnamed black community leaders did not included the organizers who would go to O'Brien's office the very next day. It was a move to politically isolate the organizers from greater Columbus community. The Dispatch announced this meeting on June 16, a days after the protest and Mayor Ginther as well as placing the story on the AP wire. The mayor's community relations staff plan to meet with area residents in an attempt to bolster support for his summer troop surge or community safety initiative. The mayor remains committed to the intensive policing program that has already taken one innocent life and removed zero illegal guns from the streets. The Dispatch and other establishment media organs remain committed to the mayor, the police and the county prosecutor. The Mockingbird remains committed to reporting the truth.